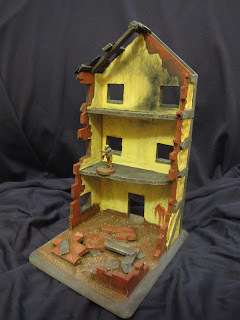 This week we delve into the world of terrain! After my most recent project, I figure it's only right that I bring a few new tricks to light. To start us off, we'll talk about the wonder that is foamcore. There are SO many uses for this wonderful terrain material! And just as many great tutorials out there for folks to find new uses for the stuff! From small shacks to huge mansions, this amazing material keeps you coming back for more. You can usually find it at your local hobby store, such as Michaels or Hobby Lobby. And if you happen to have a Hobby Lobby in your area, just wait until the stuff goes on sale! It happens pretty much every other week! 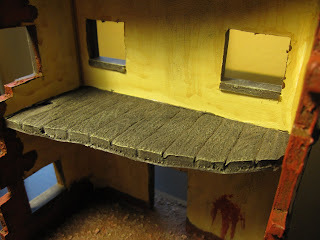 While painting my Mordheim Ruins, I realized that I just was NOT happy with the floors I had installed that were made from foamcore, just as the walls had been. They didn't have a good reason to be the same texture as the walls around them, and I couldn't come up with a legitimate excuse! So I set to thinking about what I could do to fix the issue I was having. I thought that maybe I should rip out the floors and redo them in balsa wood, but that was a bit too drastic and ultimately it came down to available balsa strips, of which I had none on hand! Maybe if I just painted it a different color, sort of like a carpet, but that fell through with the lack of appropriate texturing. I could have bought some carpet from Hobby Lobby in the doll houses section, but that would be more materials bought for a piece that is pretty much finished! That's when the idea came to me, why not strip away the card, and DRAW the slats of wood in! I set to it! Stripping away the top layer of card from the foam center, careful not to pull too fast and rip the foam. I used a hobby knife where it was being stubborn to help put the card up and away. Once both floors where cardless, I broke out a slightly dulled pencil and set to drawing in my slats. I drew lines from the front to back in lengths appropriately sized to the balsa I had used already for the framing. Once the slats were drawn in, I went back and randomly added some woodgrain as well to help texture it further. I have to say, the finished product for how quick the fix was, is well worth the little bit of effort! Could I make this technique look better? You bet! Adding varied lengths as if boards had broken individually would only take a few cuts with a hobby knife, but I'd much rather do that BEFORE gluing the floors in! So maybe next round! What other uses for the innards of foamcore can you think of?